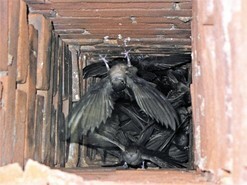 Citizen efforts to monitor Chimney Swifts have emerged across North America to help track the decline of this unique aerial insectivore. Its behavior of communal roosting and nesting in chimneys throughout cities and towns make them a fun and interesting species to monitor. During sping and fall migration Chimney Swifts fly most of the day, only roosting between sunset and dawn. During the breeding season in June and July, pairs will separate from the communal roost to nest alone in individual chimneys, and occassionally hollow cottonwoods. 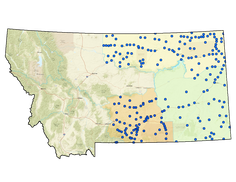 In our state, Montana Fish, Wildlife & Parks and Montana Audubon are working throughout eastern Montana to find out just where our Chimney Swifts are active and breeding. Click above for our protocol and citizen science guide to locating chimneys. Click above to view, download, and print data sheets. Click above to view our priority survey locations throughout the state. Chimney Swift surveyors can record data using a hand-held, smart device. Montana Natural Heritage Program and Montana Fish, Wildlife & Parks have designed an ArcGIS application to make in-field data entry easy. web link to access an interactive sunset calendar.